Radar measurements by NASA's Cassini spacecraft have allowed researchers to determine that some channels on Saturn’s moon Titan are deep, steep-sided canyons filled with liquid hydrocarbons. One such feature is Vid Flumina, the branching network in the upper-left quadrant of this image. Saturn's huge moon Titan harbors surprisingly deep canyons flooded with liquid hydrocarbons, a new study reports. The newfound Titan canyons are up to 1,870 feet (570 meters) deep and feature slopes that are at least 40 degrees steep, though they're fairly narrow, with maximum widths of around 0.5 miles (0.8 kilometers), researchers said. "Earth is warm and rocky, with rivers of water, while Titan is cold and icy, with rivers of methane. And yet it's remarkable that we find such similar features on both worlds," study co-author Alex Hayes, a Cassini radar team associate at Cornell University in Ithaca, New York, said in a statement. The study team, led by Valerio Poggiali of the University of Rome, analyzed radar images of Titan captured by NASA's Cassini spacecraft during a close flyby of the 3,200-mile-wide (5,000 km) moon in May 2013. The imagery focused on a channel system that drains into Ligeia Mare, a huge hydrocarbon sea near Titan's north pole. Scientists had thought that some of these canyons might contain liquid, and the newly analyzed images confirm that suspicion, showing a "glint" characteristic of very smooth surfaces. Cassini also used its radar instrument as an altimeter during the May 2013 pass, allowing Poggiali and his colleagues to measure canyon depths. These ranged from 790 feet (240 m) all the way up to 1,870 feet (570 m) — the deepest ever measured on Titan, researchers said. The canyons were probably carved by uplift of the landscape, changes in sea level or a combination of these two factors (both of which occur here on Earth as well), team members said. "It's likely that a combination of these forces contributed to the formation of the deep canyons, but at present it's not clear to what degree each was involved," Poggiali said in the same statement. "What is clear is that any description of Titan's geological evolution needs to be able to explain how the canyons got there." 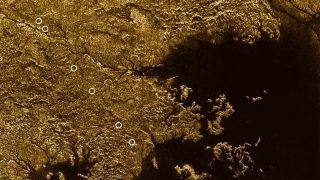 Researchers plan to characterize the other canyons Cassini has probed via radar altimetry during its close Titan flybys over the years. Such work could lead to a better understanding of the processes that have shaped Titan's landscape, NASA officials said. The $3.2 billion Cassini-Huygens mission — a joint effort involving NASA, the European Space Agency and the Italian Space Agency — launched in 1997 and arrived in the Saturn system in 2004. The Cassini mothership delivered a lander called Huygens to Titan's surface in early 2005, then continued studying the ringed planet and its many moons. Cassini will keep exploring for another year, then end its mission with an intentional death dive into Saturn's thick atmosphere in September 2017. This maneuver should ensure that the probe does not contaminate Titan and the icy Saturn moon Enceladus — both of which may be capable of supporting life — with Earth microbes, NASA officials have said.